There are six volunteer community papers in Knox, with a total circulation over 55,000 copies, around the same number as that of households in the municipality. 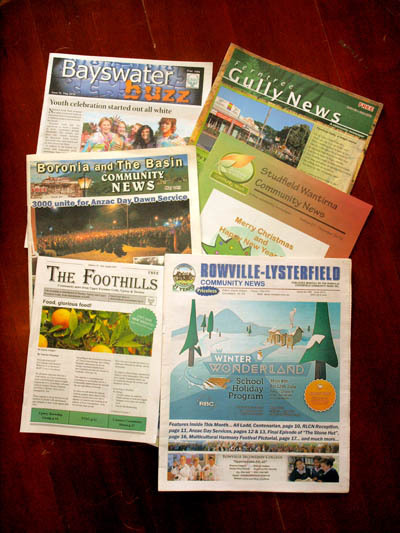 The papers are, in order of years of publication: The Rowville-Lysterfield Community News in existence for 30 years, The Boronia-Basin Community News, The Foothills (formerly Upper Gully News), The Studfield-Wantirna Community News, Ferntree Gully News and most recently, The Bayswater Buzz. All are community owned; three as independent incorporated bodies; two The Foothills and Gully News are published by community houses. The Bayswater Buzz is currently in recess awaiting a new auspicing body. All the papers are financed largely by advertising, often from small businesses who understand the importance of offering their services in a strong community. The two oldest papers are published monthly, three are bi-monthly and The Buzz is quarterly. Each paper is produced and distributed by big teams of volunteers, many of whom put in long years of service. Each paper, while quite individual in style and content, has as its vision and goal to strengthen and connect community. The editors are hoping that by sharing their challenges and opportunities, their newspapers can continue to fulfil their role.